Friends of Jesus, today, we are celebrating the Feast of Saint Joseph, the husband of the Blessed Virgin Mary and the Patron of the Universal Church. Who was St. Joseph? And what do we know about him? Most of what we do know of him is found in the First and Third Gospels of Matthew and Luke. From this, we are to understand that Joseph was God's choice of a foster father for Jesus. Joseph was a respectable and righteous man. [Mt. 1:19] Based on the teachings of the virginity of Mary, we learn that the relationship that Joseph enjoyed with the Blessed Virgin Mary was a chaste marriage. Then we hear of the trial of Joseph when an angel appeared to him in a dream. Joseph was told to take the Child and His mother and to flee to Egypt and remain there until he was told to leave. For Herod was about to seek out Jesus in order to kill Him [Mt. 2:13] when he heard that a child had been born King of the Jews. [Mt. 2:2] Obeying the angel, by night, Joseph took Mary and Jesus to Egypt. [Mt. 2:14] Escaping to Egypt also served the purpose of protecting the Kingship of Jesus. The last mention of St. Joseph in the Holy Bible is when Jesus was twelve years old and the family made their annual pilgrimage to the Holy City. This is when Jesus stayed behind in the Temple without the knowledge of His parents. For three days, Joseph went through great anxieties. [Lk. 2:41-8] Not only did he have to cope with having lost his foster Child Jesus, but he also had to support Mary who must have been worrying to the point of not being able to sleep at night. This was a heavy cross for St. Joseph to bear. Over and above what has just been said, in some Bible passages, Jesus is referred to a the Son of Joseph. [Jn. 1:45, 6:42, Lk. 4:22] This confirms that Joseph was the adoptive father of Jesus. 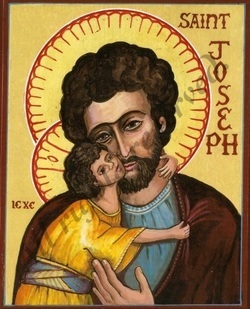 The Feast of St. Joseph can be traced to the 4 th century in the Eastern Church. This Feast was entered on July 20 th in an old Coptic calendar that is in the possession of the Church. In 1621, Pope Gregory XV declared the Feast of St. Joseph as a Feast of obligation. In 1726, Pope Benedict XIII inserted the name of Saint Joseph in the Litanies of the Saints. And finally, in December, 1870, according to the wish of the bishops and the faithful, Pope Pius IX declared St. Joseph as the Patron of the Catholic Church. As is perceived from all these facts, the recognition that St. Joseph received was very progressive in the Church, certainly not equal to the recognition that the Virgin Mary received over the centuries. Briefly reviewing today's three readings, our hearts perceive other wonders about Saint Joseph. The First Reading speaks of Yahweh being a Divine Father to us as His people. The Second Reading speaks of our spiritual father Abraham. The Gospel speaks of the end of the lineage of our spiritual fathers, Saint Joseph. From the First Reading and other Biblical passages, we also learn that Saint Joseph was of royal blood. He was a descendant of king David. Saint Joseph was born at a time when the Jewish nation no longer had a ruling king. Saint Joseph was a king without a throne and a crown. By marrying the Blessed Virgin Mary and through the adoption of our Lord Jesus as his foster child, Saint Joseph surrendered his kingship to Jesus. Through Saint Joseph, Jesus legally became the rightful King of this world, over and above being the King of the Kingdom of God. I should clarify here that when we are talking of the Kingdom of God, we are speaking of two different Kingdoms. Therefore, the Kingship of God the Father over earth was ruled by men chosen by God for a period of time during the days of the Old Testament. The Lord God, who once ruled the earth over His people before the days of Samuel, has once more regained His Divine Kingship through Jesus Christ. Through Joseph who surrendered his kingship to Jesus, this was accomplished. Under the protection of Saint Joseph, Jesus accomplished His mission on earth to rightfully regain His Kingdom in Heaven through death on the cross. Through the royal blood lineage of Saint Joseph, Jesus accomplished His mission on earth to rightfully regain His Kingdom on earth. While many of us know very little about St. Joseph, viewing him as an old man who protected the Virgin Mary, there are many hidden mysteries regarding his life. To perceive these mysteries regarding his life, we must ask ourselves, "Why did God choose Joseph and not someone else?" It was because, through Joseph, mankind was about to restore God as the true King, a Kingship that rightfully belonged to Him.